" Articles in Category: Ukraine	"
My great thanks to Angie Coiro of In Deep Radio for filling in for us last week! More than 2,000 were reportedly wounded and over 50 killed as Israel opened fire on protesters in Gaza today during the "festive" opening ceremony for the controversial U.S. embassy Donald Trump moved from Tel Aviv to Jerusalem. Much of the Muslim and Arab world condemned the attacks on the unarmed Palestinian protesters, but so so did the European Union, the United Nations, Russia and many others. Back in the U.S., a new analysis from Washington Post finds that an administrative error led to at least 26 Democratic leaning voters being assigned to the wrong legislative district during last November's House of Delegates election in Virginia. The race in Newport News between Democrat Shelly Simonds and Republican David Yancey in HD-94, was judged to be a tie after a "recount", which was subsequently broken by a random drawing giving the seat to Yancey and allowing the GOP to retain control of the House. That failure, and similarly mis-assigned voters in yet another highly gerrymandered district in Fredericksburg, prevented what should, in retrospect, have been a Democratic takeover of the state's House in 2017 amidst a "Blue Wave" that otherwise managed to flip 15 seats from R to D.
In addition to every single voting machine being hacked at last weekend's DefCon hackers conference in Las Vegas, electronic pollbook systems were also hacked there, and one contained the personal records of some 650,000 Tennessee voters. A long-serving, top EPA official resigns citing Trump Administration rollbacks to environmental protection in a blistering exit letter [PDF]. Over the weekend, Washington Post and New York Times each reported on unnamed sources alleging a "secret" "consensus" of U.S. intelligence agencies charging Russia tried to interfere with the Presidential election in order to help Donald Trump defeat Hillary Clinton. National security journalist and author Marcy Wheeler of EmptyWheel.net offers a measure of skepticism about the explosive reports on those allegations, which she suggests could echo what proved to be blatantly misrepresented and cherry-picked intel by the George W. Bush Administration in their run-up to the Iraq War. 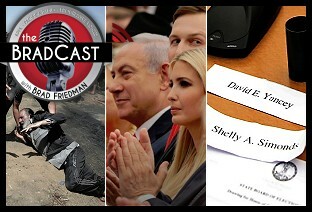 We discuss what we know and don't know concerning the newly reported charges, which parties have an interested in forwarding them and why they are arising in this form now, and how those concerns can possibly square with seemingly contradictory resistance --- by both Republicans and Democrats alike --- to human verification of the stunning and poll-defying 2016 Presidential election results reported in Michigan, Wisconsin, Pennsylvania and elsewhere. All of that amidst a repeated, coordinated, well-funded and familiar efforts by Republicans and Team Trump to block any and all verification of Presidential election results in all three states. "Cronyism, bureaucratic obstruction, and legal maneuvering have run roughshod over the democratic process," Stein said following Friday's Supreme Court decision in MI after tens of thousands of votes were deemed "unrecountable" due to the state's arcane "recount" laws while the attempted count was still underway last week. "A recount should not be this difficult or controversial. If you take out money from a bank, the teller counts it twice --- and the second time, they count it in front of your eyes. It should be well understood that something as important as a presidential election requires a basic level of quality assurance and verification." • Breaking news from today's on-air shooting in Roanoke, VA.
• Why Donald Trump actually matters (and not just to Republicans) and why Democrats might think twice about being quite as gleeful about his potential (likely?) nomination. • And then, a whole bunch of listener callers discussing all of the above and much more on today's live show. It's been just over one year since we were told by Sec. of State Kerry and President Obama that pro-Russian separatists in Eastern Ukraine shot down Malaysia Airlines Flight 17 killing all 298 on board. The evidence to support the claims, as repeatedly cited by Sec. of State John Kerry at the time, was based largely on "social media". But no hard evidence has been presented by the U.S. since that no time. 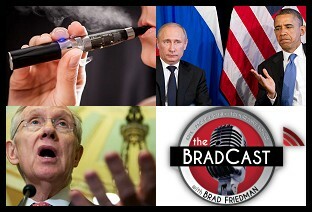 On today's BradCast, we are joined by retired, 27-year CIA analyst turned peace activist Ray McGovern, who personal delivered the CIA's Presidential Daily Briefings to several Presidents, including Ronald Reagan and George H.W. Bush. His organization,Veteran Intelligence Professionals for Sanity (VIPS) --- which includes several high-ranking former intelligence professionals and whistleblowers --- have called, once again, on the U.S. to release any evidence to support their claims that Russia was behind the downing of MH17. "We're investing 90 billion dollars a year in U.S. intelligence and when push comes to shove, we have to rely on social media?," he asks incredulously. "The evidence is as sketchy as one could imagine." In fact, he goes on to tell me on today's program that "there is no good evidence that pro-Russian separatists, so called, or the Russians themselves shot down that plane. I am morally certain were there to be such evidence, it would be [shouted] from the housetops as proof that Kerry was right."" In support of his disturbing assertions, McGovern cites, for example, the so-called "Government Assessment" that was publicly issued by the Administration just days after the incident, in place of a traditional "Intelligence Assessment". "What [Kerry] offered was a 'Government Assessment', which means it was written in the White House, which means it was a political document written by political hacks, and that the intelligence analysts would not sign on to it," McGovern tells me. "That is significant. This is a new genre of report not supported by the intelligence analysts, and that speaks volumes." "The reason why there could be no intelligence assessment," he asserts, "is because my former colleagues were honest enough to prevent that. They said, 'look, we don't want to sign on, like our former colleagues did, in a fraudulent estimate saying Iraq has weapons of mass destruction'." McGovern, who is decidedly non-partisan (see his infamous personal 2006 confrontation with then-SecDef Donald Rumsfeld over lies about WMD, for evidence) offers several cases of similar misinformation offered by the U.S. in the recent past (during his time with the Reagan Administration, for example), and goes on to explain why he believes the U.S. is concealing "available" evidence and/or failing to correct previous assertions during our must-listen conversation on today's show. IN TODAY'S RADIO REPORT: Rightwing Heartland Institute says 'climate change will be good for you! 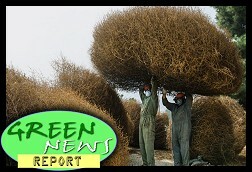 '; Russia threatens to cut off natural gas supplies to Ukraine, Europe; PLUS: Attack of the Tumbleweeds! (No, really!)... All that and more in today's Green News Report! 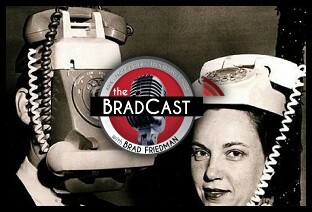 I haven't gotten to go to the phones for weeks on the KPFK/Pacifica Radio BradCast, so that's what we did on this week's show. No guests. Just me, a few rants, lots of callers (and, of course, Desi Doyen and the latest Green News Report). The rants included more on the mad media misinformation/neo-con war-baiting over Ukraine (which, thankfully, it appears Obama no longer seems to be falling for or taking the bait on); the Democrats woeful 2014 campaign plans and --- the one that got ALL the phone lines ringing off the hook --- the rapidly increasing media disinformation about e-cigs. Lots of good calls, but my favorite on that last was from "David in Los Angeles". I think his opinion may be a nearly perfect distillation of the entire, insane backlash against the public health miracle that is vaping. David describes his concern: "We don't want to encourage the behavior of smoking, even if its not harmful." My question to him is, "Why?" He explains: "because it's the perceived behavior that is negative." You'll have to tune in to see how that call, and all the others, worked out. I asked Bret Baier of Special Report on Fox 'News' for comment on this graphic via Twitter, but he has, so far, declined to respond. Ever since the situation in Ukraine began to blow up (again), I've been trying to figure out what's really been going on. It hasn't been easy. And the U.S. corporate media has not been particularly helpful (again). My attempt to sort out fact from fiction after last weekend's '97.6%' referendum vote in Crimea is just one example of finding the facts running counter to the U.S. MSM narrative. 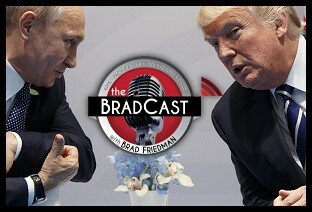 We pick up that thread on this week's KPFK/Pacifica Radio BradCast, as I was joined by investigative reporter Robert Parry of ConsortiumNews.com to try and sort much of it out. 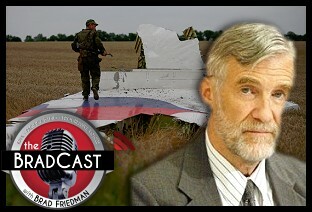 His must-read article, "Mainstream US Media Is Lost in Ukraine", tying together blatant media failures on Iraq and Syria and now in Ukraine, begins to crack the nut of what the U.S. media is failing to tell us about the entire fine mess, including some startling audio evidence that we play on the show suggesting that certain narratives --- for example, the one about now former Ukraine President Viktor Yanukovych's police gunning down protesters --- may be much less (or, at least, much different) than has been generally reported in this country. Parry explains how "The U.S. mainstream news media is reaching a new professional low point as it covers the Ukraine crisis by brazenly touting Official Washington’s propaganda themes, blatantly ignoring contrary facts and leading the American public into another geopolitical blind alley." You'll want to hear this conversation. 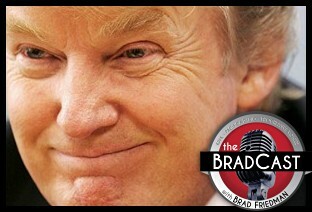 In the back half of the show...we cover The BRAD BLOG's exclusive this week on a great new gift for election hackers --- just in time for the 2014 mid-terms! ; the one WI Republican state Senator willing to stand up against Gov. Scott Walker's voter suppression; Sen. Whitehouse's theory on Citizens United and climate change denial; and, of course, Desi Doyen joins us with the latest Green News Report, as usual. How Legitimate is Crimea's '96.7%' Referendum Result? In a blog item on Monday, law professor Ilya Somin, of the Washington Post's right-leaning "Volokh Conspiracy" blog, declared the weekend's reported 96.7% vote in favor of Crimea joining Russia to be either fraudulent or the result of voter intimidation of some kind. In the article, Somin called the results "dubious" and "highly improbable," declaring at least three times in his very short, 6-paragraph item that the referendum's results were "achieved" (his quotes) and/or "likely tainted by fraud or intimidation" --- the likelihood of which Somin describes as a "fact." "It is highly improbable that 96.7% would have voted yes in a genuinely free vote, since the Crimean population includes large Ukrainian and Crimean Tatar minorities that are overwhelmingly opposed to a return to Russian rule," the George Mason University School of Law professor instructs. 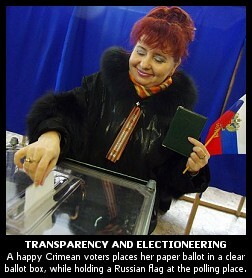 "Crimean officials are also reporting a high 83% turnout. If that figure is correct, it makes it unlikely that the 96.7% result is explicable by selective turnout. If, on the other hand, officials are lying about the turnout, they could be engaging deception about the vote margin as well." "We cannot accept this result as legitimate because it does not meet international standards and because there has not been an investigation of the numerous and credible reports of fraud and abuse." -- U.S. Secretary of State Colin L. Powell, 11/24/04. 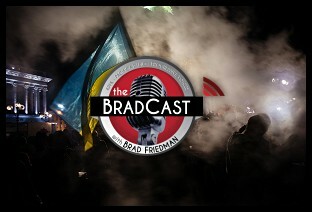 In regards to Ukraine's recent election and the announced U.S. rejection of the results. From The Washington Post.